More than half a millennium since its construction, the Mehrangarh Fort still dominates Jodhpur, a city of a million in northwest India. The ramparts rises from the sandstone cliffs, a mountain dividing the town from the Thar Desert. The formidable towers of lower gates are potted with indentions from cannonball fire, reminders of the last failed attempts to capture the fort in the 1800’s. The restored citadel within the stone walls sheds light on the past wealth of Jodhpur’s rulers. Marble columns in grand halls support spacious ceilings covered in paintings, gold leafage, and precious gems. 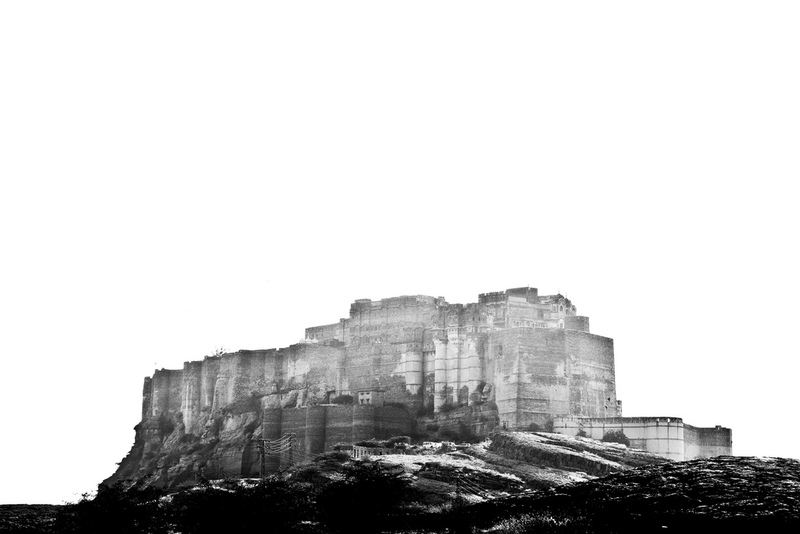 On a trip to Jodhpur last fall, I strolled to the fort’s outer edge and took in the city’s vast expanse. Antique cannons squatted nearby. It was late afternoon and a layer of low clouds had begun to drift over the crenel, bringing with it reprieve from the afternoon swelter. Some call Jodhpur “Sun City.” “Blue City,” others say. As contradictory as they sound, these sobriquets are tightly bound. Jodhpur’s weather is blazing. To temper the heat and ward off mosquitoes, many of the houses are painted indigo blue. The sugarloaf spires of the Jain temples, the beehive Sikharas of the Hindu temples, and the lighthouse-shaped minarets of the mosques rise above the blue buildings and labyrinthine streets. I craned my neck out over the walls, making sure my feet stayed touching the parapet, and was surprised to see, dancing over the city, a lone orange kite. I focussed on the string that held it aloft, trying to trace the kite to the hand that guided it. In my search, my eyes were drawn downwards to where four young boys and a dog, like scouts from an ancient army looking for weak points in the fort’s defenses, scampered up boulders at the base of Mehrangarh. On a nearby rooftop, a woman swathed in a colorful sari stood beside two large basins of soap and rinse water. Bending, rising, swaying, she moved the pieces of brightly colored laundry between the basins in an almost dance-like rhythm before clipping them to a clothesline. I kept looking. Who was flying that kite? Then a second kite appeared, a pink one, flying in a parallel line below the orange kite. I followed them both to a group of boys on a rooftop not far from the base of the fort. The rooftop was a mosaic of blue and white tiles. The boys were laughing through the struggle to keep their kites soaring on the updraft. The kites were light and agile, the boys jaunty, small and yet strong. The Jodhpur royal family has long since abandoned the Mehrangarh Fort for the swanky Umaid Bhavan Palace two miles away. Mehrangarh’s obsolete defenses offer inadequate protection from modern-day threats, which are met by the Indian Army’s 12th Infantry Division and the 32nd Wing of the Indian Air Force, both stationed at nearby bases. The fort remains a priceless historical landmark, a requisite for any trek through Rajasthan, if for nothing else than its matchless vistas of Jodhpur. But no matter who you are, in any time, any place, it is always better to fly kites with your friends than peruse the parapets of the past alone. Scott Robertson lives and writes in India.